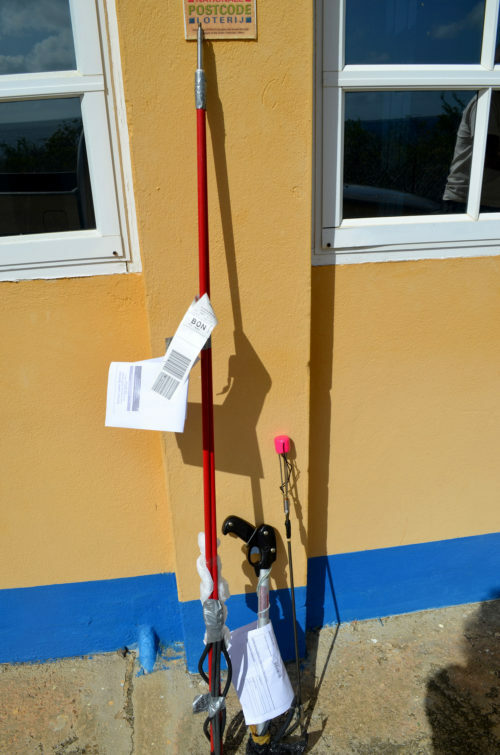 Bonaire Customs Agents regularly confiscate spearfishing gear from tourists entering Flamingo airport. Spear fishing is prohibited by law in Bonaire waters since 1971, as the use of harpoons do much damage to our coral reef. It is not allowed to enter Bonaire with any kind of spearfishing device. Due to our nature laws, Bonaire is considered a model in coral reef conservation, including dealing with the lionfish invasion since the first sighting of this invasive species in October 2009. In order to combat the lion fish invasion there is a program implemented involving resident volunteer hunters who keep the lion fish density low (compared to other islands of the Caribbean). These divers are all trained, certified hunters with a STINAPA permit which enables them to use the STINAPA Marine Park supplied ELF’s (ELF = Elimination Lion Fish). The ELF is the only tool that is approved for hunting this invasive species. To qualify for an ELF a Lionfish hunting course must be taken on island. Afterwards the certified hunter can apply for a STINAPA permit for the use of a STINAPA registered ELF, which is also provided by STINAPA. All other spearfishing devices are prohibited and will be confiscated by Customs Agents or STINAPA Rangers. Only STINAPA registered ELF’s are allowed to be used in the Bonaire National Marine Park when hunting the Lionfish. STINAPA is grateful to the Customs Agents for their vigilance.